For over 15 years, we have encouraged the use of our medical grade adhesive tapes with our Sap Sheets (detox patches) to enhance the healing process. Now, after exhaustive research and development, we proudly announce a new edition of adhesive tapes made with Carbon-Titanium. Carbon is an excellent conductor of bio-electricity. When combined with Titanium (which is biocompatible) and placed on the body in these adhesive strips, the bioelectrical currents are stimulated, balanced and renewed. When the bioelectric flow is restored, muscles relax and blood circulation increases. This, in turn, allows for the relief of pain, more flexibility and ease of movement. Many athletes and sports enthusiasts in Japan use these tapes because they relieve pain and are 100% hypoallergenic, which means that will have absolutely no allergic reaction on the body. Carbon-Titanium adhesive tapes are the perfect choice for anyone with recurring pain or a sensitive skin condition. Hypoallergenic, bioelectrical treatment utilizing the fusion of carbon and titanium. Carbon-Titanium adhesive tapes are also effective in relieving the symptoms of tendonitis, bursitis, certain types of arthritis and many other conditions. Testimonials from users claim more ease of movement, flexibility and improved performance. When Carbon-Titanium adhesive tapes are used together with our Sap Sheets (detox patches), they enhance the emission of far-infrared rays and negative ions and speed the healing process. Carbon-Titanium is known for its ability to balance and enhance the body's electrical system, or commonly known as bioelectrical system. Electrical charges in our cell assisted by the changes of Potassium and Sodium. Each body cell is able to generate 50 millivolts of electricity. We are electrical beings. Our cells, tissues and membranes pulse with electricity every second in an effort to communicate. This concept of intercellular communication through electrical current is referred to as bio-electricity. Scientists have captured images of cellular tissue that show electrical signals speeding along nerve pathways and plasma membranes. If something happens to disturb this electric current or energy (such as an injury or illness), then these lines of communication are disrupted. The result is pain, tenseness, reduced blood flow and discomfort. Carbon-Titanium adhesive tapes with Kenrico Sap Sheet can help speed up the recovery from these symptoms. Principles and Applications of Bioelectric and Biomagnetic Fields (online book). 1. Results. The following research (captured by an independent laboratory) verifies that our Carbon-Titanium adhesive tapes double the amount of far infrared rays and negative ions emitted from Kenrico Sap Sheets. 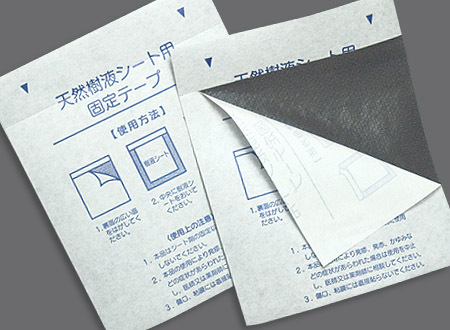 This means that these adhesive tapes increase the effectiveness of our Sap Sheets. To date, Kenrico Sap Sheets emit the highest count of far infrared rays and negative ions to speed the healing process. Recorded at the start of application. Recorded 6 minutes afterwards, far infrared rays were starting to emerge. Recorded 30 minutes afterwards, Kenrico Adhesive Tapes with Carbon Titanium visibly helped the far infrared rays to spread forth. Recorded 1 hour afterwards. Notice the far infrared rays spread to other parts of body. 2. Quality and Safety. We proudly stand behind the effectiveness and quality of our products which are produced in accordance with GMP standards. Our Carbon-Titanium adhesive tapes are made of the highest qrade ingredients and are hypo allergenic - even the most sensitive skin conditions can tolerate our products. 3. Variety. 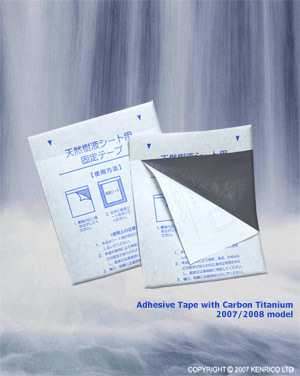 With the addition of the Carbon-Titanium adhesive tapes, we now have two varieties of adhesive tapes to choose from. Both are manufactured using the highest standards of GMP quality, with the same level of thickness, elasticity, and hypo allergenic ingredients.